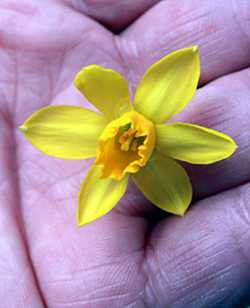 A flowering bulb well known to many gardeners, is the miniature daffodil Narcissus Tete-a-Tete. This lovely unassuming flower of late winter and early spring is a welcome sight soon after winter’s cold has passed. It is an intriguing plant in many regards, not the least of which is its somewhat uncertain origin. Narcissus Tete-a-Tete (or more aptly N. ‘Tête à Tête’) is truly a miniature daffodil, standing 20-30 cm tall at most. Growth usually starts in March, soon after the worst of winter is over. By the middle of March and into early April the flowers open, some singly, but often in pairs (hence its name, meaning a conversation between two people). Occasionally three or even four flowers will be borne per stalk. They are presented just above the leaves and resist toppling over, even in high winds – two excellent attributes for a daffodil. Narcissus Tete-a-Tete has typical tunicate bulbs, but is truly dwarf in habit, standing no more than 30 cm high. Each flower is small and dainty, no more than 3-4 cm across. The corona is long relative to the out-most ring of tepals, thus qualifying it as a trumpet type daffodil. It is bright orange. The tepals (sepals + petals) are a brilliant lemon yellow. While these tend to lay in a more of less flat ring, some can recurve backward a bit, revealing one of its parent plants, N. cyclamineus. N. Tete-a-Tete flowers are long lasting and make good subjects for cut arrangements. N. Tete-a-tete has typical tunicate bulbs, much like other daffodil bulbs, but they are bit smaller than most. They grow many offsets and plants form large clumps in a short time. These can be left intact and they will continue flowering well for many years. N. Tete-a-Tete is a known allotriploid hybrid – that is a complicated way of saying it has at least two ancestral parents and an extra set of chromosomes compared to most other similar plants. Without a doubt the seed parent was the primary hybrid between N. cyclamineus and N. tazetta ‘Grand Soleil d’Or’, called N. ‘Cyclataz’, an heirloom daffodil variety. What is somewhat unknown is the pollen parent – it either was a crossing with another N. ‘Cyclataz’ or back onto N. cyclamineus. Based on genetic studies, it is well established that both parent species’ chromosomes are present, but since the seed set was spontaneous, we’ll never know the other parent for sure. The flowers of Narcissus Tete-a-Tete are bi-colored and often borne in pairs. Since it does not easily fall within the 11 divisions of other daffodil types, it is classified as division 12, miscellaneous hybrids. 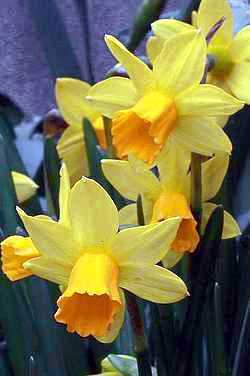 It is perhaps the best known of all miniature daffodil hybrids, and very popular in the bulb trade. Naming and genetics aside, this is one fantastic miniature daffodil. There is nothing negative I can say about it. It tends to flower a bit earlier than most other daffodils, just as most spring crocus are fading. The flowers are generously produced, even on clumps that haven’t been divided for years. They open just above the tops of the leaves, never buried within them. My plants have grown for years now with little to no help from me. All I do is clean up their bed in the spring of fallen leaves and weeds. I do not fertilize them. They are in a fair amount of sun, up to 5 hours a day while in growth. By mid summer, after they have gone dormant, their bed is shaded by brugmansia bushes that grow back after being burned to the ground during winter. This doesn’t seem to bother them (or other flowering bulbs in this area). Like other daffodils, it will endure light shade while in growth, but prefers at least some sunshine. Narcissus Tete-a-Tete flowers are as miniature as the plant, no more than 3-4 cm across. N. Tete-a-Tete seems quite adaptable to most soils, accepting a pH range from somewhat acidic to a bit sweet. I grow them in Kyushu’s native volcanic loam with no amendments and they seem to thrive. They are said to grow well in heavy soils provided they don’t become water logged. Given their dwarf habit, they make great container plants as well. They are easy to force flower, up to a month or more before the normal flowering period. If you do force them, don’t be surprised if they sulk for a couple seasons after. Propagation is done by division. Any time after the leaves die down is fine. Unlike other daffodil bulbs, it is not necessary to divide clumps on a routine basis in order to keep the flower count high. Large clumps seem to flower on and on regardless – much like N. tazetta. Having said that, dividing clumps is an advantage and will increase your stock. 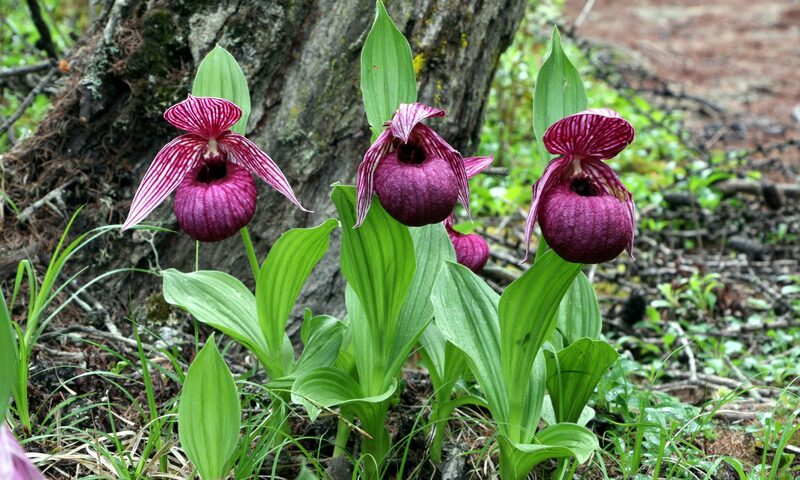 N. Tete-a-Tete is a sterile plant and therefore cannot be used in making new hybrids. Another nice feature of this plant is its temperature tolerance. In my area summers are blisteringly hot, over 30 C daily for two or more months without a break, and yet they thrive. Conversely, while dormant the bulbs are amazing cold resistant as well. USDA cold hardiness zones 4-8 are indicated for this daffodil, but they can be pushed to zone 9 where winters are on the cool side (e.g., coastal areas of the Pacific Northwest in the USA, the warmer part of the British Isles, and southern Japan). If your winters average 10 C or lower for two months, that should be adequate. Narcissus Tete-a-Tete readily forms clumps and is generous with flowering – a must have miniature daffodil. Here is another flowering bulb that is a must have, and unless you live in a very cold winter area or the tropics, you can grow it with little effort. You can’t ask much more from a plant! I need to know how tolerant they are to road salt. 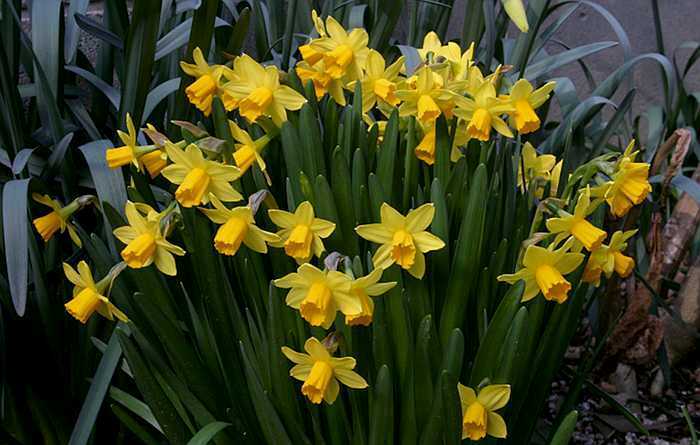 No daffodil enjoys salt, but probably can take a certain amount of it provided that rain or irrigation flushes most of it away before their growth commences in spring. The only catch is that these plants grow and flower very early – April or even March. I received some of these cute little daffodils as a present. They were forced and in a small pot. They do look lovely and I would like to plant them in my yard for next year. Should I leave them in this small pot until they naturally die back, then store them in the garage in a paper bag until Fall? Any other tips would be greatly appreciated. I live in USDA zone 6 with rocky, alkaline soil. I’ve had luck with forced daffodils by planting them out directly once the worst frost has passed, so for you that may be sometime in April. Don’t attempt to remove them from their pot since they’ll have a well developed root system that should be preserved for the summer months. Even if the leaves die down before planting them out, keep the pot warm and moist. Unless you get really strange weather next fall or winter, they should grow on schedule next spring. One note, I’d find a way to soften and acidify their bed though – lots of organic material for instance. Thank you! I plan on getting a lot of compost and amending the soil prior to planting the end of April/beginning of May. So, I should keep them moist and warm in their pot until after the last frost, then remove them carefully from the pot to keep the roots intact? Then plant outdoors and see what happens next Spring? I hope that sounds right. Sounds fine. These guys are pretty easy to grow and flower actually. Good luck! I bought a small pot of these at the grocery store while they were blooming. They have since stopped and the foliage is dying off. Can I save these bulbs and plant them later this Spring once the ground is thawed…will the flowers come back? As long as the bulbs are still alive, yes they should come back. Perhaps they won’t be as vigorous next year, but will improve the following year if they are happy. Good luck! pot? I have not. Please advise. I bought a small pot of Narcissus tete a tete from the super market, containing 4 bulbs that had already their leaves. Today, after two days a couple of flowers started appearing. Can I transplant them in a bigger pot and add some soil special for plants bearing flowers? The pot is so small and one can see the bulbs… I live in Greece and the temperatures this time of the year are between 5 and 15 degrees Celsius. Also after they are finished, do I leave the bulbs as are in the pot? Sorry for the late reply. Sure you can repot them, but be careful so that you don’t hurt the roots. Those temperatures are fine for this species. If you keep them in the pot I recommend putting them outside to grow since they won’t do well indoors. If you can plant them in a garden, that is even better. Happy growing! I bought a tray of 4 Narcissus bulbs in late January. I left them in my kitchen and they bloomed very quickly but then became very leggy and sprawling outwards. I figured the warmth of indoors was causing this, so I moved them outdoors. The temperature is about 0 to 5 Degrees Celsius and they get plenty of rain but still haven’t improved. Is there anything I can do to help them along? About your narcissus – don’t worry about them being leggy since they all tend to grow that way after flowering. When mine are finished blooming I tie their leaves into lose knots so they don’t flop over. I do recommend you plant them into a garden setting however if you live in an appropriate climate. The more sun they get, the more they will flower. Also, bulbs that have been forced to flower early should not be kept in pots and forced again the next season since this will weaken them.